Donate to UCF just by shopping online! Imagine being able to make a donation to UCF every time you shop online and at no extra cost to you. This commission is already included in the price of what you’re buying. This means you can support UCF at no extra cost to you. 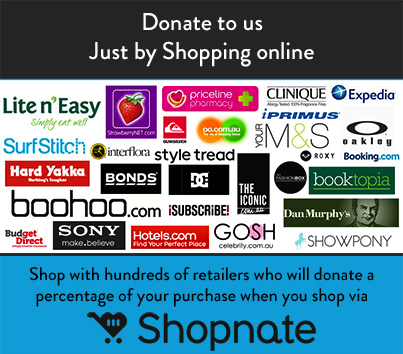 Click to join Shopnate via our page – just click the pink “Support Us” button – and your donations will automatically be passed to UCF. Install UCF Easy Fundraiser for mobiles and/or desktops (Chrome), which highlights the partner retailers in Google. Whenever you visit a partner retailer Easy Fundraiser appears at the top of your screen. Click the button ‘YES – ACTIVATE DONATION’. Easy Fundraiser turns green so that you know that any purchase you make means the retailer will donate to UCF. If you have any questions, please contact Vicki on 0404 211 330.